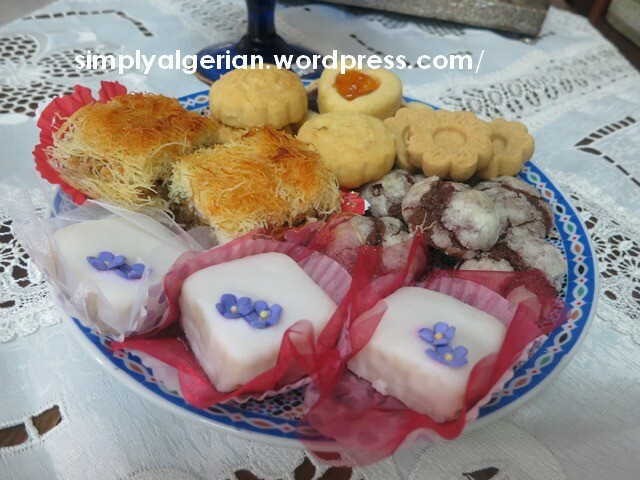 Made from a homemade ground almonds paste, a hint of lemon zest, topped with bright royal icing and decorated with a range of different designs……….mkhabez can be considered an iconic example of this culinary combination. A classical , old- fashoned mkhabez would have a triangular shape , covered with white, blue or pink royal icing and decorated with a small drage’. 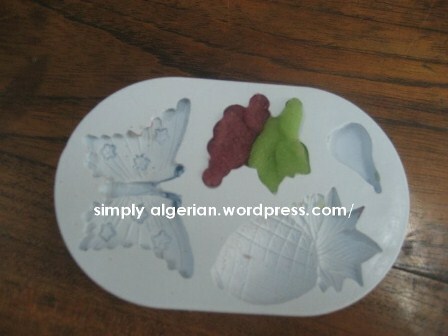 Nowdays, mkhabez , like the rest of Algerian cookies have adopted a whole new sophisticated look ….and every year, a dozen of books are being published in Algeria ,offering new decorative designs that are very hard to beat. 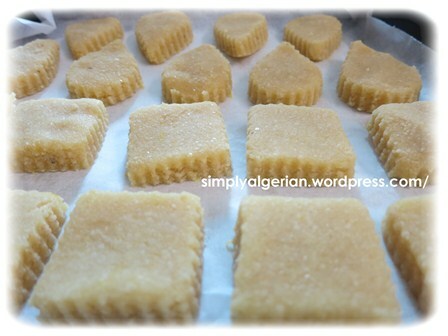 I like to make mkhabez for Eid , not only because I’m an almond lover who can’t resist the yummy taste of these treats but also because they are very easy to make. 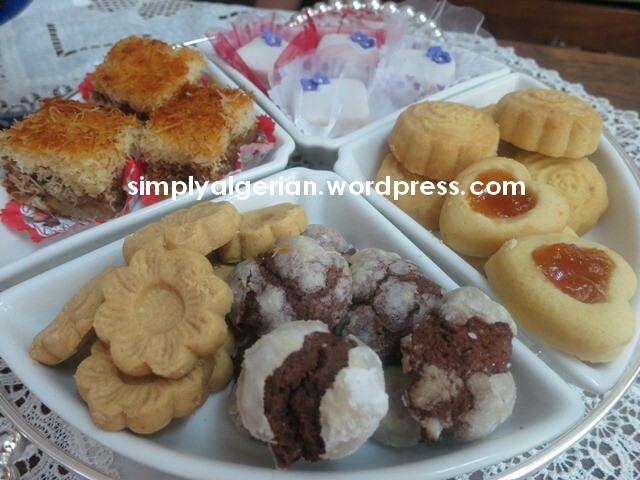 The hardest part is to wait for the icing to dry…… There are dozens of royal icing recipes out there, and every Algerian cookie- maker has her favourite….. 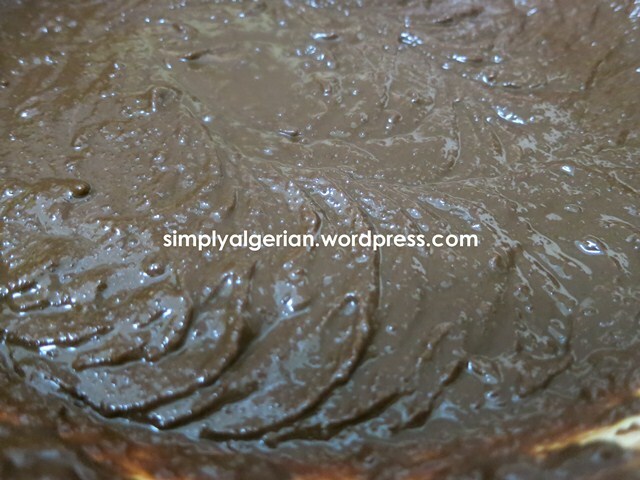 The difficult part for the newbies is the absence of icing sugar weight in Algerian recipes and the relial on » your eye is your balance » policy…..
the icing recipe that I’m happy with is taken from one of meme Benberim books. as it yields a big quantity of icing, I always cut it unto half. the traditional mkhabez recipe calls for 3 measures of ground almonds and 1 measure of fine sugar. I like to use half measure of sugar to make a balance with royal icing wich is already very sweet. Combine fine ground almond with sugar , add vanilla, zest , butter. gradually add the egg white until you form a nice dough ( not dry nor sticky) . if you feel it’s too dry, add another white , one spoon full at a time ( beat egg white with a fork so you can use it easily ) if the dough sticks to your hand, you can add one or two tbsp of ground almond. lightly cover your working surface with corn startch ( i prefer rolling the dough on a cling film ) roll your almond dough into 1&1/2 to 2 cm thick. deep the cookie cutter of your choice into cornstarch and cut your almond dough into any shape you fancy. arrange the cookies on a tray covered with parchement sheet. bake for 10 to 15 mn . the cookie should look pale and uncooked when taken from the oven. leave completely to cool and dry . you can prepare the cookies days ahead and freeze them before icing them. In a saucepan, combine the water, sugar, orange blossom water and lemon juice, cook for few minutes under low heat . 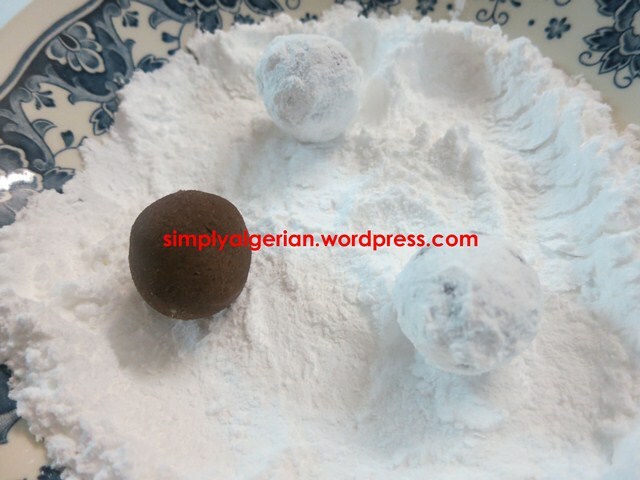 leave to cool, incorporate the egg white then gradually add the sifted icing sugar until you get the desired consistancy ( neither runny nor stiff) add flavour and colouring of your choice. 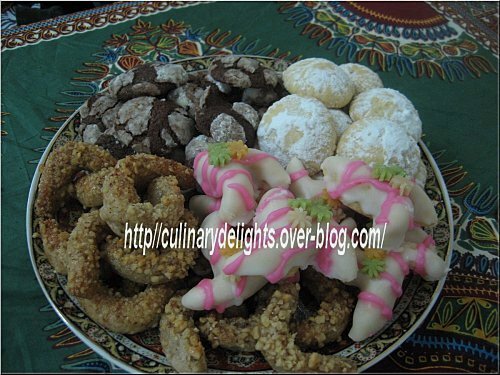 dip the cookies in the icing ,remove and arrange on a tray or rack . 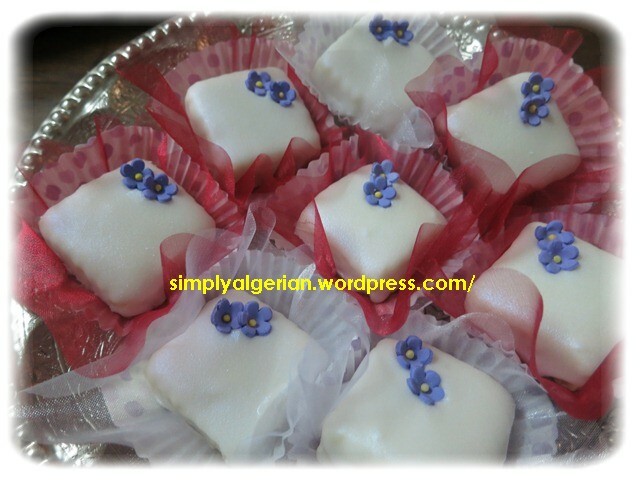 when it’s half dried, decorate with marzipan flowes or almond halves. 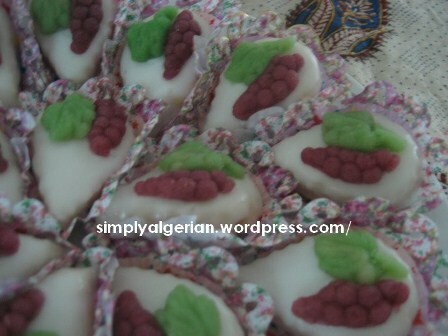 I decorated mine with sugar flower and ready made marzipan , shaped into bunches of grapes, thanks to this silicone mould , kindly offred by my dear friend Kouky when I payed her a visit in 2010. 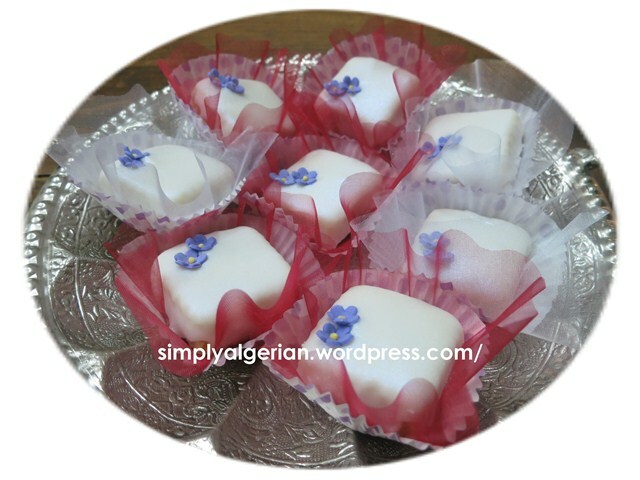 Pour ceux et celles qui suivent la blogosphere Maghrebine et Algerienne en particulier, les mkhabez n’ont plus besoin d’introduction!ces petits fours typiquement Algerois composes de pate d’amande maison et garni de glacage royal sont une petite merveille qui explosent en bouche grace toutes ces saveurs apportees par le gout des amandes fraichement moulues, les accents acidules du zeste de citron et le croquant du glacage. vous trouvez des centaines de recettes sur le net avec tellement de decorations qu’on sait plus ou donner la tete . 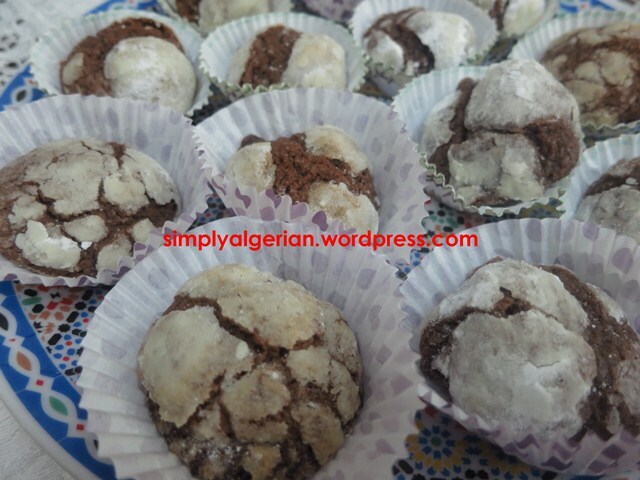 Dans ma version, je prefere mettre une demie mesure de sucre au lieu d’une, comme dans toutes les recettes qui necessitent un glacage notemment dans le mkhabaz qui, est directement glace’ et non pas envelope’ de pate pouvant casser le cote’ sucre’ comme c’est le cas des arayechs ou couronnes glacees. 1 ou 2 de blanc d’oeufs pour ramasser la pate (legerement battus a la fourchette pour pouvoir les ajouter par petite quantite’). NB: le beurre et le blanc d’oeuf ( a l’oppose’ de l’oeuf entier ) apportent du moelleux a la pate d’amande. saupoudrer le plan de travail de maizena ( ou bien etaler la pate sur un papier film ) etaler la pate sur une epaisseur assez epaisse . couper a l’emporte piece. 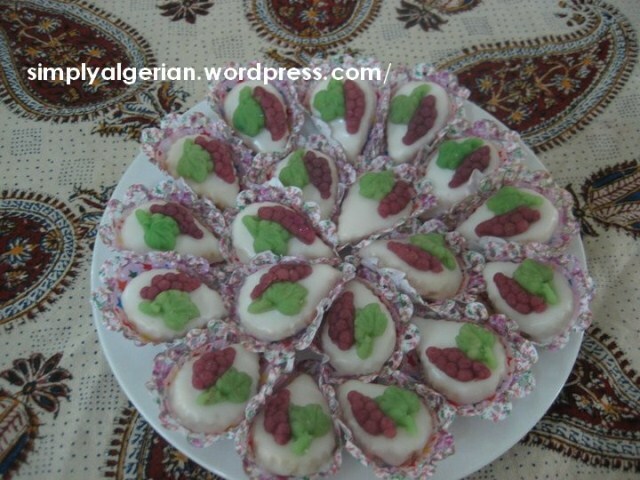 j’ai donne’ aux miens, la forme carree’ et goute que j’ai decore’ avec des grappes de raisin a la pate d’amande, pourr reproduire le mkhabez d’atomne de kouky , a qui je dis, joyeux anniversaire ! les disposer sur une tole beurree’ et farinee’ ou mieux encore chemisee’ de papier sulfurise’.,prechauffer le four a 160 degres . faire secher pendand 10 a 15 mn selon les fours . les biscuits doivent sortir pales et moux au toucher car ils vont par la suite secher au contact de l’air libre . si vous les laissez trop longtemps au four, ils risquent de devenir tres durs. laisser refroidir completement avant de glacer. vous pouve les cuire quelques jours a l’avance , les congeler et les glacer le moment voulu . noter qu’il faut les consommer le lendemain du glacage et non pas le jour meme. dans une casserole, mettre a cuire l’eau ,le sucre , ajouter la fleur d’oranger et le jus de citron. retirer la casserole au bout de 1o mn laisser refroidir , ajouter le blanc d’oeuf , et incoporer le sucre glace tamise’ , en petites quantites jusqu’a l’obtention d’une pate consistante. ajouter le parfum et le colorant de votre choix. tremper les gateaux refroidis dans le glacage et retirer aussitot. decorer avec des fleurs en pate d’amande quand le glacage est semi sec. servir le lendemain . 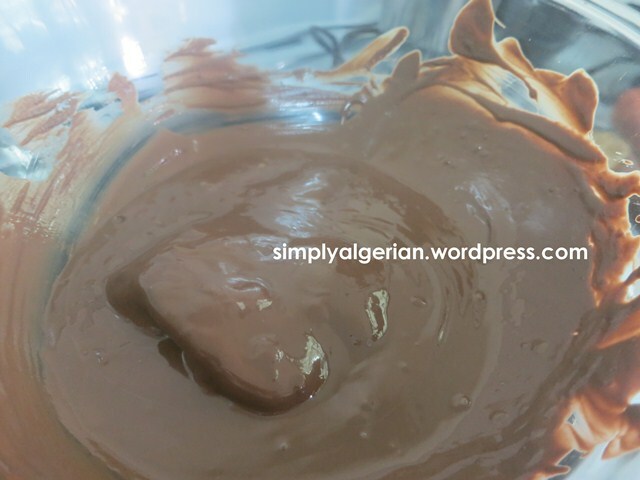 il existe plusieures versions sur le web, ….avec du cacao a la place du chocolat, de l’huile ou du beurre fondu a la place du beurre ramolli…..etc…. differentes sources leur donnent differents noms…. 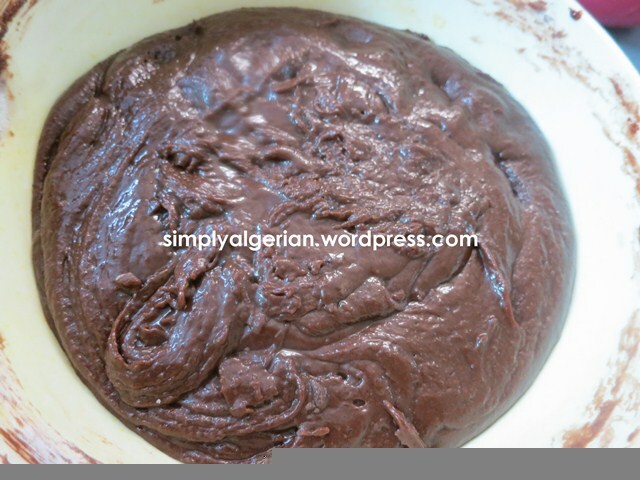 craqueles au chocolat…. 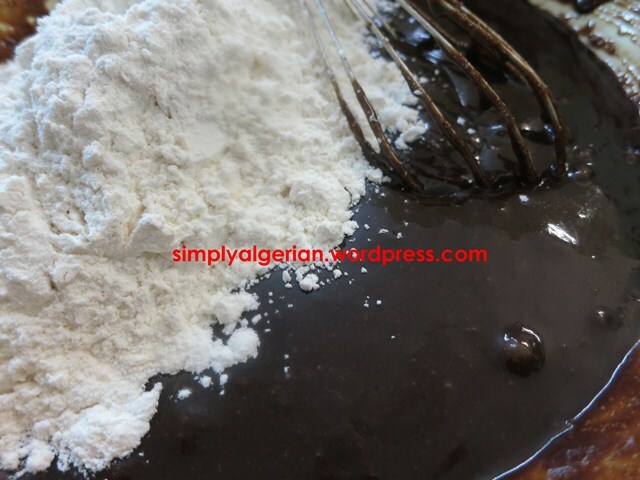 black and white….ou tout simplement ghraiba au chocolat comme j’aime les appeller. Apres avoir essaye’ une autre version d’un tres celebre site, je suis revenue a cette recette qui reste ma preferee’ et donne des biscuits moelleux, bien chocolates qui plairont aux grands avant les petits. je vous les conseille vivement !!!! ces ghraibas sont tres faciles a preparer mais leur reussite reside dans la manipulation de la pate. il est imperatif de la laisser au frigo pendant 2 ou 3 h le temps de la rafermir. pas la peine de la laisser plus de temps. car si les boules de pate sont tres dures, elles ne vont pas bien craqueler en cours de cuisson. si par contre elles sont trous molles, elles vont s’etaler comme les cookies americains. pour un meilleur gout, choisissez un chocolat de bonne qualite’. Dans un saladier, tamiser ensemble la farine, le sel et la levure chimique. reserver. Dans un autre saladier , battre le beurre , le sucre , ajouter le chocolat fondu et prealablement refroidi , jusqu’a l’obtention d’un melange homegene et cremeux. ajouter les oeufs , un a un tout en continuant de battre. incorporer la farine et bien melanger jusqu’a l’obtention d’une pate plutot molle. enveloper le saladier d’un film alimentaire et le placer au frigo pendant 3 heures. passe’ ce temps, la pate sera compacte et plus facile a travailler. prechauffer le four a 180°C. prendre l’equivalent d’une demie cuillere a cafe’ de pate, la rouler entre les mains . l’enrober de sucre cristalise’ ( pas fait ) puis de sucre glace. plus il y’aurra du sucre, plus les biscuits seront craqueles ) . les disposer sur une plaque chemisee’ de papier sulfurise’. quand vous aurrez mis la premiere fournee’ a cuire, mettre le restant de pate au frigo en attendant la cuison des premiers bicuits. s’il fait trop chaud, et que la pate commence a coler aux mains, pensez a les enduire d’huile pour pouvoir former vos boules sans difficulte’. enfourner pendant 8-10mn, les biscuits seront mous a la sortie du four mais vont vite durcir au contact de l’air. s’ils seront trop craqueles a la sortie du four , les redresser au doigt tant qu’ils sont encore chauds. laisser refroidir avant de les decoler. conserver dans une boite hermetique. essayez les et vous m’en direz des nouvelles! 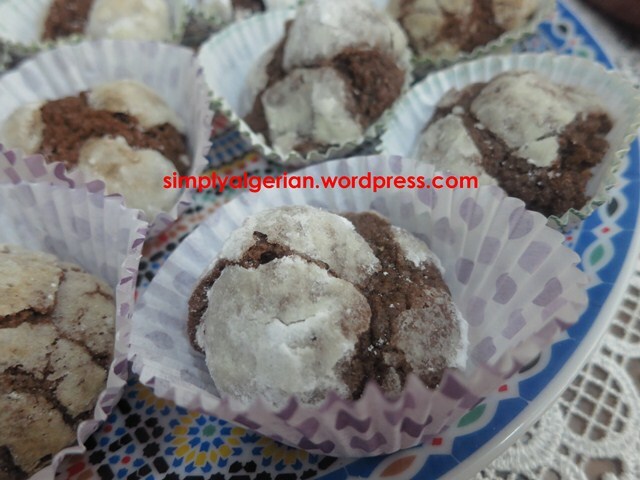 I tried these cookies, last year for aid adha and they were so popular with my children that they quickly became a family favourite . .
these chocolate crinkles stand for all what children would love to find in a cookie: chocolaty, delicious with an attrative look and a fudgy texture that make them them ideal for serving, any time of the year…. I didn’t make lots of tweeking to the original recipe except for reducing the amount of sugar and ommitting the granulated sugar as I used milk chocolate which , eventually is much more sweeter than the dark type. here’s the original recipe and my tips in red. In a bowl , mix together the flour, the salt and the baking powder. 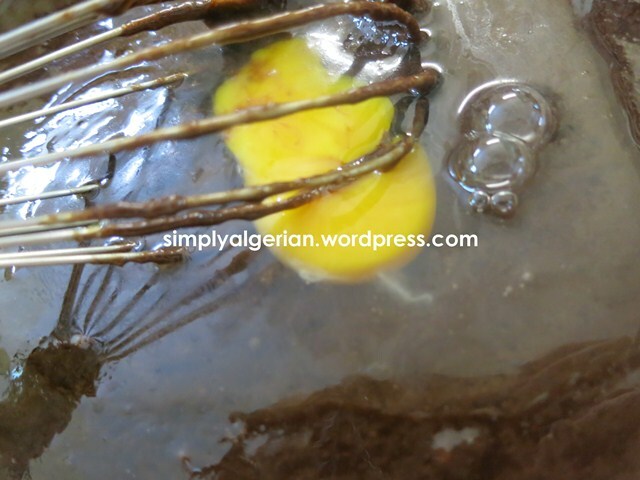 Add the eggs, one at a time and mix them in without overbeating them . Line two or three baking sheets with baking paper. Then roll it in powdered sugar and coat really well. 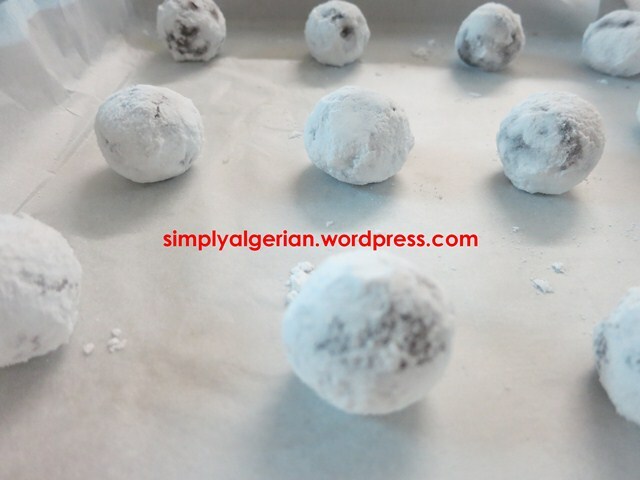 Place thus formed snow balls on a baking sheet and bake for 8-10 minutes. ( they will look soft and uncooked when taken from the oven, but will soon harden ). while baking the first tray, place the rest of the dough in the fridge to avoid softening the dough. Let them sit on the baking sheet for a while and then transfer to cooling rack.